There were Olympic Games scheduled for 1916, although they would never take place because of World War I. The 1916 Olympic Games – the Games of the VIth Olympiad – were scheduled for Berlin, Germany. Berlin had made a bid to host the 1908 Olympic Games but withdrew the bid at the 1904 IOC Session so that the vote for London could be unanimous. It then moved forward its bid to the 1912 Olympics, and at the 1908 IOC Session in London the two candidate cities for 1912 were considered to be Berlin and Stockholm. But at the 1909 IOC Session (in Berlin), Berlin announced that it could not host the 1912 Olympic Games and they were awarded to Stockholm. The 1916 host city was discussed at the 1911 IOC Session but the decision was made at the 1912 Session in Stockholm. Official bids had been returned from Berlin, Alexandria (EGY), and Budapest (HUN), but Alexandria and Budapest withdrew during the Session and Berlin was elected unanimously as the host city for the Games of the VIth Olympiad. Germany also proceeded with the building of a great stadium to host the Olympic Games. The design and construction had actually begun in 1911, prior to the bid for the 1916 Olympics being awarded to Berlin. The stadium contained a 400-metre running track, surrounded by a 600-metre cycle track, with a 100-metre swimming pool at the north end of the stadium. The stadium seated around 30,000 spectators. Kaiser Wilhelm II dedicated the stadium on 8 June 1913, in celebration of his 25th anniversary as head of the German Reich. A number of IOC Members were present at the dedication. After various demonstrations and exhibitions of athletic events, General von Podbielski gave the closing speech, and urged the 3 million members of German athletic groups to put all their efforts into victory at the 1916 Olympics. But the 1916 Olympic Games never came to pass, for fairly obvious reasons. On 28 June 1914, in the Bosnian capital of Sarajevo, Gavrilo Princip shot and killed Archduke Franz Ferdinand, heir to the Austro-Hungarian Empire. The incident precipitated the war, and in July 1914, Austro-Hungary declared war on Serbia. Germany soon joined with the Hapsburg Empire and declared war on Russia and France a few days later. In August, Germany invaded Belgium and Great Britain then entered the war against Germany. Incredibly, the Germans continued to make plans to host the 1916 Olympic Games, though they were met with opposition within the IOC as well. British IOC Member Theodore Andrea Cook demanded the expulsion of the German members from the IOC. When this was refused, Cook resigned from the IOC in protest. It was fortunate, given that ultimatum, that the Olympic Movement would wait until 1920 and Antwerp. The above was modified from Appendix 4 from my book on the 1920 Olympic Games (with Tony Bijkerk) – The 1920 Olympic Games: Results for All Competitors in All Events, with Commentary. Jefferson, N.C.: McFarland, 2001. The following was Appendix 2 from my book on the 1920 Olympics (Jefferson, NC: McFarland Press, 1999). Seems very appropriate to reprint here on this weekend. Slightly more than 6,000 athletes competed in the Olympic Games from 1896 to 1912. They represented the “Youth of the World,” our best and brightest, most of them in the primes of their lives. But when war broke out in 1914, the Olympians often represented those best able to serve their nations as soldiers. Many of them did fight in World War I, but not all of them returned. On the morning of the Opening Ceremony, 14 August 1920, Cardinal Mercier, gave a Te Deum mass in honor of the Olympian War dead. Following are some of those poignant tales. Canadian physician, soldier, and poet John McCrae published this famous poem in 1915 about the Allied dead buried in Belgium. In 1904, Arthur Wear played tennis at the St. Louis Olympics, winning a bronze medal in the men’s doubles. When I was growing up in St. Louis, my Father took me to Jefferson Memorial once a year to see the names of his fallen friends from WWI chiseled on the wall. The Memorial was built with money left after St. Louis’ World’s Fair and Games of the Third Olympiad expenses were paid. My father had been a sergeant in the 89th Division, 354th Infantry and knew Captain Wear, an Olympian, who won a bronze medal in the tennis doubles competition with Clarence Gamble here in 1904. Before my Father’s death in 1980, he gave me his history of the 89th Division, 1917, 1918, and 1919 (a part of the AEF and Army of Occupation). He was with the Division for the entire time it was on duty on the USA, France, Belgium and Germany. There I discovered an account of Captain Wear’s death which has never been published (p. 205). “Trying to cross the Meuse near Pouilly on November 5, 1918. The crossing could not be made at that time. The Armistice was signed on November 11, 1918, just days after Captain Wear’s death. His name appears in memory as a soldier not far from the tennis venue where he competed in the Olympic Games of 1904. Octave Lapize competed in the 1908 Olympic Games as a cyclist, and won a bronze medal in the 100 kilometre track race. He likely then became the greatest professional cyclist among former Olympians in the pre-War years. Lapize won the Tour de France in 1910, Paris-Brussels 1911-1913, and Paris-Tours 1911, and is still the only person to have won Paris-Roubaix in three consecutive years – 1909-11. A pilot in the French military, he was killed in a dogfight during World War I. Though Percival Molson failed to place in the 1904 400 metres, he would achieve his fame later, but it would cost him his life. Molson, the great-grandson of John Molson, founder of Molson Breweries of Canada, attended McGill, from which he graduated in 1900, after serving as president of his senior class and gaining every athletic honor the university could offer. When World War I broke out, he joined the Princess Patricia’s Canadian Light Infantry, and fought for them at the Battle of Mount Sorrel in 1916. He was wounded during the battle and returned home, receiving the Military Cross for his efforts. He insisted he be allowed to rejoin the company and on 5 July 1917, while fighting on the outskirts of Avion, France, he was hit by mortar fire while attempting to rescue a fallen friend. Both were killed. In his honor, the main athletic stadium at McGill University is known as the Percival Molson Memorial Stadium. In 1912, the New Zealander, Tony Wilding, won a bronze medal in the men’s covered courts tennis singles. It was a minor highlight of the career of the man who may still be considered New Zealand’s greatest ever tennis player. Anthony Wilding attended Trinity College, Cambridge, and based himself in England. He was Australian champion in 1907, Victorian champion in 1908-09, and won the singles at Wimbledon for four straight years, 1910-13. He fought for the English during World War I and was killed by shellfire on the Western Front while serving as a captain in the Royal Marines. At the 1912 Olympic Games, athletics fans thrilled to the feats of Hannes Kolehmainen, who won the 5,000 metres, the 10,000 metres, and the cross-country. But Kolehmainen’s greatest race was the 5,000 metres, where Frenchman Jean Bouin pushed him to his limit, with both breaking the world record, Kolehmainen finishing inches ahead of Boyin. Jean Bouin became a foot soldier during World War I. On 29 September 1914, Bouin was killed by an artillery shell that hit him squarely in the chest. It was felt to be friendly fire. When will they ever learn, when will they ever learn? And where have all the soldiers gone, long time passing? Where have all the soldiers gone, a long time ago? And where have all the graveyards gone, long time passing? When will they ever learn, oh when will they ever learn? In his book Who’s Who of UK & GB International Athletes 1896-1939, British Olympic historian Ian Buchanan noted the following British track & field Olympians who made the final sacrifice during World War I.
Anderson, Gerard (ATH-1912) (*15 Mar 1889 – †09 Nov 1914) Killed in action 9 Nov 1914 while serving with the Cheshire Regiment. Anderson, William (ATH-1906) (†4.1915) Killed in action April 1915 while serving as a private with the Canadian contingent. Ashington, Henry (ATH-1912) (*25 Sep 1891 – †31 Jan 1917) Killed in action while serving with the East Yorkshire Regiment. Astley, Arthur (ATH-1908) (†1916) Killed in action. Butterfield, George (ATH-1908) (*1882 – †17 Oct 1917) Killed in action while serving as a gunner with the Royal Field Artillery. Chavasse, Noël (ATH-1908) (*9 Nov 1884 – †04 Aug 1917) one of only three men to have been awarded a bar to the Victoria Cross. Served as a captain in the RAMC he was first awarded the VC in 1916 and awarded the bar, posthumously, in 1917. Killed in action Brandhoek, Ypres, France. Flaxman, Alfred (ATH-1908) (*1 Oct 1879 – †01 Jul 1916) Killed in action in an attack on the enemy positions at Gommercourt, France. Hawkins, George (ATH-1908) (*13 Oct 1883 – †22 Sep 1917) Served as a gunner in the Royal Artillery. Killed in action when a shell exploded in the doorway of a dugout while he was on outpost duty. Hutson, George (ATH-1912) (*22 Dec 1889 – †14 Sep 1914) Killed in action as a regular soldier with the Royal Sussex Regiment. Kitching, Frederick (ATH-1908) (*7 Jul 1886 – †1914) Killed in action in Dunkirk, France. Leeke, Henry GBR ATH-1908 15 Nov 1879 29 May 1915) Killed in action in France on the eve of his battalion’s departure for Gallipoli. Served with the Royal Warwickshire Regiment. Macintosh, Henry (ATH-1912) (*10 Jun 1892 – †26 Jul 1918) Commissioned into the Argyll & Sutherland Highlanders and was killed in action on the Somme. Patterson, Alan (ATH-1908/12) (*12 Mar 1886 – †4 Mar 1916) Killed in action in France. Roche, James (ATH-1908) (*1886 – †07 Jun 1917) Served as a lieutenant with the Royal Engineers and won an MC in WWI, before being killed in action in France. Wilson, Harold (ATH-1908) (*22 Jan 1885 – †1916) Killed in action in France. Yorke, Richard (ATH-1908/12) (*28 Jul 1885 – †22 Dec 1914) Killed in action in France while serving as a sergeant in the London Scottish. There were certainly many others, but many of their stories have never been told. In his excellent series of books entitled Olympische Sommerspiele, Volker Kluge lists the Olympic athletes who died in World War I. In addition to Kluge’s lists, Ian Buchanan has done research on the British athletes who died in World War I. The following list combines the research of these two prominent Olympic historians. Listed after the name are the nation, the Olympic sport and year of competing in the Olympics, followed by the dates of birth and death. We chaired your through the marketplace. And home we brought you shoulder high. From fields where glory does not stay. It withers quicker than a rose. Cannot see the record cut. Of lads who wore their honors out. The still defended challenge cup. A garland briefer than a girls. In 1919, a prelude to the 1920 Olympic Games took place on the outskirts of Paris. These were the 1919 Inter-Allied Games and they had their origins in 1910 in the Philippine Islands. In that year, Elwood S. Brown was sent to the Philippines as the Physical Director of the American YMCA (Young Men’s Christian Association). His charge was to build up sporting activities among the American civilian population and eventually the Filipino natives. Brown was successful and was also instrumental in helping convince the Filipinos to compete in the first Far Eastern Games in 1919. Through Brown’s efforts, sports became much more popular in the Far East. Official A.E.F. championships in a wide variety of competitive sports including military events, beginning with elimination regimental contests, ranging upwards through the divisions, possibly the army corps, and culminating in great finals in Paris. Physical pageants and demonstrations to be held in many centers demonstrating to our allied friends America’s best in sport, her great play spirit and incidentally her finest in physical manhood. Interallied athletic contests – open only to soldiers of the Allied Armies – a great set of military Olympic Games. The officers and men of the American Expeditionary Forces, being keenly appreciative of the splendid relations which exist among those who have borne arms in a great, common cause, and which, in the present instance, have so happily developed into such deep feelings of mutual respect and admiration, are most anxious to preserve and strengthen this relationship in every way possible. Now that active military operations have ceased, they believe that nothing could be more conducive to this end than to gather in friendly competition on the field of sport, representatives of the Armies of each of the nations which have so long been associated together in the stern struggle for right. Accordingly, they have decided to organize an Inter-Allied Athletic Meeting, to be held in the Colombes Stadium, Paris, during the month of May or June, 1919, in which the officers and men of all of these Armies shall be eligible to take part. As Commander-in-Chief of the American Expeditionary Forces, I have the honor, therefore, to invite, through you as their Commander-in-Chief, the officers and men of the armies of France to participate in these contests and to express the earnest hope that many of them may do so, so that the ties of the much cherished spirit of comradeship which have spring from the gallant joint effort of our forces on the battlefield may thus be even more closely cemented. Australia, Belgium, Brazil, Canada, China, Cuba, Czechoslovakia, France, Great Britain, Greece, Guatemala, Haiti, Hedjaz, Honduras, Italy, Japan, Liberia, Montenegro, Nicaragua, Newfoundland, New Zealand, Panama, Poland, Portugal, Romania, Russia, Serbia, Siam, and South Africa. Hedjaz was a Kingdom on the Arabian Peninsula that later became a part of Saudi Arabia. Of these, eventually eighteen nations competed at the Inter-Allied Games. Australia, Belgium, British Army of the Rhine, Canada, Czechoslovakia, France, Great Britain, Greece, Guatemala, Hedjaz, Italy, Newfoundland, New Zealand, Poland, Portugal, Romania, Serbia, and United States. Eventually, not all of the scheduled events were held. Notably, there was no American football competition. A few events were also added to the above program. The Inter-Allied Games took place at the Pershing Stadium, which was situated near Paris. It was on the eastern edge of the Bois de Vincennes on the ancient highway between Vincennes and Joinville-le-Pont. Originally the Games were to have been held in the Colombes Stadium in Paris, where the 1924 Olympic Games would take place. But the Colombes Stadium was felt to favor the American athletes unfairly and it was not used as the main venue. Instead, it was decided to build a new stadium, which became the Pershing Stadium. Incredibly the construction began only on 11 April 1919 and was completed within 60 days. The stadium seated 25,000 spectators. The Inter-Allied Games began on 22 June 1919, with an Opening Ceremony in the Stadium. They were formally opened by Monsieur Leygues, the French Minister of the Navy. The Games lasted for exactly two weeks, ending on 6 July 1919. While most of the events took place in the Pershing Stadium, there were other venues used as well. Swimming took place in the St. James Lake in the Bois de Boulogne in Paris. The equestrian competition was held at Chennevières. The fencing was conducted at the École d’Éscrime in Joinville. Rugby football took place at Colombes Field in Paris. The golf matches were held on the La Boulie Course on the outskirts of Paris. Tennis competition occurred at the Racing Club de Paris and Stade Français de Paris. Shooting was conducted far removed from Paris, at the d’Auvours range near Le Mans. The 1919 Inter-Allied Games ended on Sunday, 6 July. Two events were held that day – a baseball game between the United States and Canada, and the light-heavyweight boxing final. The baseball game was ended prematurely, with the United States leading 12-1. Canada agreed to stop the game to allow the Closing Ceremony to take place in the Pershing Stadium. General Pershing presided and received all the champions in the Tribune d’Honneur, awarding them their prizes. The Ceremony ended with the formal lowering the flags of the Allied Nations. This post was modified from an Appendix to my book on the 1920 Olympic Games: The 1920 Olympic Games: Results for All Competitors in All Events, with Commentary. Jefferson, N.C.: McFarland, 2001. World War I ended at the 11th hour of the 11th day of the 11th month, 100 years ago. On our website www.olympedia.org, we provide lists of all Olympians who died during wars. Sadly, there are over 625 Olympians on that list. Tony Wilding, killed at Aubers Ridge during the Battle of Neuve-Chapelle. Andrey Akimov RUS FTB 1912 †1916. Killed during World War I.
Gordon Alexander GBR FEN 1912 †24 April 1917. Killed in action during World War I.
Laurie Anderson GBR ATH 1912 †9 November 1914. Killed in action while serving with the Cheshire Regiment. William Anderson GBR ATH 1906 †April 1915. Killed in action France. Henry Ashington GBR ATH 1912 †31 January 1917. Killed in action France. Louis Bach FRA FTB 1900 †16 September 1914. Killed in action. Fritz Bartholomae GER ROW 1912 †12 September 1915. Killed in action during World War I.
Georg Baumann RUS WRE 1912 Missing-in-action during World War I but date and place not known. Béla Békessy HUN FEN 1912 †6 July 1916. Killed in action during World War I.
Isaac Bentham GBR SWI/WAP 1912 †15 May 1917. Killed in action during Battle of Arras. Renon Boissière FRA ATH 1912 †25 September 1915. Killed in action in World War I.
Henri Bonnefoy FRA SHO 1908 †9 August 1914. Killed in action during World War II. Hermann von Bönninghausen GER ATH 1908-12 †26 January 1919. Died from wounds from being shot in the face in World War I.
Hermann Bosch GER FTB 1912 †16 July 1916. Killed in action in World War I.
Jean Bouin FRA ATH 1908-12 †29 September 1914. Killed in action by friendly fire. Hanns Braun GER ATH 1908-12 †9 October 1918. Died as a fighter pilot near Saint-Quentin Aisne France in World War I.
Karl Braunsteiner AUT FTB 1912 †19 April 1916. Died as a prisoner of war. Kurt Bretting GER SWI 1912 †30 May 1918. Killed in action during World War I.
Wilhelm Brülle GER GYM 1912 †5 August 1917. Killed in action during World War I.
Heinrich Burkowitz GER ATH 1912 †November 1918. Missing in action in November 1918 somewhere in Belgium. Edmond Bury GBR RAQ 1908 †5 December 1915. With the 11th Battalion King's Royal Rifle Corps he was killed in action in France during World War I and is buried in Rue-Petillon Military Cemetery in Fleurbaix. George Butterfield GBR ATH 1908 †24 September 1917. Killed in action France. Giuseppe Caimi (DNS) ITA FTB 1912 †14 December 1917. For his courage and boldness he received by Royal decree a posthumous gold medal for military valour. Oswald Carver GBR ROW 1908 †7 June 1915. With the 1st/2nd East Lancashire Royal Engineers he was killed in action in Turkey in World War I and is buried in the Lancashire Landing Cemetery. Joseph Caullé FRA ATH 1912 †1 October 1915. Killed in action during World War I.
Ralph Chalmers GBR FEN 1908 †8 May 1915. Killed in action during World War I.
Noel Chavasse GBR ATH 1908 †4 August 1917. He is one of only three men to have been awarded a bar to the Victoria Cross. Serving as a captain in the RAMC he was first awarded the VC in 1916 and a bar posthumously in 1917. Geoffrey Coles GBR SHO 1908 †27 January 1916. Killed in action during World War I.
André Corvington HAI FEN 1900 †13 December 1918. Killed in action in World War I near Reims. Percy Courtman GBR SWI 1908-12 †2 June 1917. Part of 6th Battalion Manchester Regiment he was killed in action in World War I. Buried at Neuville-Bourjonval British Cemetery. Harry Crank GBR DIV 1908 †22 October 1917. Killed in action near Ypres Belgium. Robert Davies GBR SHO 1912 †9 September 1916. A member of the 1st/9th Batallion London Regiment (Queen Victoria's Rifles) he was killed in action in the Somme in France in World War I.
Louis de Champsavin FRA EQU 1900 †20 December 1916. Killed in action during World War I.
Félix Debax FRA FEN 1900 †25 August 1914. Killed in action in World War I.
Alex Decouteau CAN ATH 1912 †17 October 1917. Killed in action in the Battle of Passchendale. Oszkár Demján HUN SWI 1912 †4 September 1914. Killed in action during World War I.
Charles Devendeville FRA SWI/WAP 1900 †19 September 1914. Killed in action. Karl Baron von Diepurg GER IOC 1909-14 †25 October 1914. Killed in action during World War I.
Joe Dines GBR FTB 1912 †27 September 1918. He was killed in Pas de Calais as a second lieutenant on the Western front during World War I.
Herman Donners BEL WAP 1908-12 †14 May 1915. Killed in action World War I.
Jimmy Duffy CAN ATH 1912 †23 April 1915. In September 1913 he joined the Canadian Army and was assigned to the 91st Argyle Regiment. On April 23 1915 he was fatally wounded near Ypres Belgium. Hugh Durant GBR MOP/SHO 1912 †20 January 1916. With the 9th Queen's Royal Lancers he was killed in action in France in World War I and is buried in the Vermelles British Cemetery. Eric Fairbairn GBR ROW 1908 †20 June 1915. Killed in action in the Somme in France during World War I.
René Fenouillière FRA FTB 1908 †4 November 1916. Killed in action during World War I.
Léon Flameng FRA CYC 1896 †2 January 1917. Killed in action during World War I.
Alfred Flaxman GBR ATH 1908 †1 July 1916. Killed in an attack on the enemy positions at Gommecourt. Mauricio Galvao GER HOK 1908 †6 March 1945. Killed in action in World War II. His grave is in the war cemetary in Zagreb Croatia. Bert Gayler GBR CYC 1912 †23 June 1917. Killed by rifle fire during an ambush in a valley near Kotkai Bozi Khel. Bernhard von Gaza GER ROW 1908 †25 September 1917. Killed in action during World War I in Belgium. Thomas Gillespie GBR ROW 1912 †18 October 1914. A lieutenant with the King's Own Scottish Borderers he was killed in action in France in World War I and is buried in Le Touret Memorial. Henry Goldsmith GBR ROW 1908 †9 May 1915. Killed in action at Fromelles. Lajos Gönczy HUN ATH 1900-06 †4 December 1915. Killed in action in area of Galicia and Lodomeria. Carl Heinrich Goßler GER ROW 1900 †9 September 1914. Killed in action during World War I.
Ámon von Gregurich HUN FEN 1900 †28 June 1915. Killed in action during World War I.
Jaroslav Hainz BOH TEN 1912 Died in Russia in World War I but further details not known. Juho Halme FIN ATH 1908-12 †1 February 1918. Killed in action in Finnish Civil War. Wyndham Halswelle GBR ATH 1906-08 †31 March 1915. Killed by a sniper's bullet in France. George Hawkins GBR ATH 1908 †22 September 1917. During World War I he served as a Gunner with the Royal Artillery and was killed in action when a shell exploded in the doorway of a dugout while he was on outpost duty. Harold Hawkins GBR SHO 1908 †16 June 1917. Reported missing between Bullecourt and Croisilles. When last seen he was wounded lying in a very forward position which unfortunately had to be abandoned. Cecil Healy AUS SWI 1906-12 †29 August 1918. Killed in action in World War I.
Max Herrmann GER ATH 1912 †29 January 1915. Killed in action in World War I.
George Hutson GBR ATH 1912 †14 September 1914. Killed in action only five weeks after the outbreak of World War I.
Albert Jenicot FRA FTB 1908 †22 February 1916. An under-lieutenant with the 165th Regiment D Infantry he was killed in action in World War I.
Walther Jesinghaus GER GYM 1912 †1918. Killed in action during World War I.
Ernest Keeley RSA SHO 1912 †23 July 1918. A 2nd lieutenant with the 4th Regiment South African Infantry Unit he was killed in action in World War I and is buried in the Ploegsteert Memorial. Frederick Kelly GBR ROW 1908 †13 November 1916. Killed in action during World War I.
Paul Kenna GBR EQU 1912 †30 August 1915. Killed in action at the Battle of Gallipoli. Alister Kirby GBR ROW 1912 †29 March 1917. Served as a captain in the Rifle Brigade and died from illness in 1917. Frederick Kitching GBR ATH 1908 †1914. Killed in action in World War I.
Adolf Kofler AUT CYC 1912 †13 April 1915. Killed in action during World War I.
Georg Krogmann GER FTB 1912 Krogmann was killed in action in 1915 in Poland during World War I.
Nikolay Kynin RUS FTB 1912 †1916. Killed during World War I.
Ivan Laing GBR HOK 1908 †30 November 1917. With the 2nd Battalion Coldstream Guards he was killed in action in France during World War I and is buried in Metz-en-Couture Communal Cemetery British Extension. Octave Lapize FRA CYC 1908 †14 July 1917. Killed when his plane was shot down near Verdun. Béla Las-Torres HUN SWI 1908-12 †13 October 1915. Killed in action in Italy during World War I.
Henry Leeke GBR ATH 1908 †29 May 1915. Killed in action on the eve of his battalion's departure for Gallipoli. Erich Lehmann GER ATH 1912 †9 July 1918. Listed as missing in action in World War I.
Feliks Leparsky RUS FEN 1912 †10 January 1917. Killed in action in World War I.
Bertrand Count de Lesseps FRA FEN 1908 †28 August 1918. Killed in action during World War I.
Ismaël de Lesseps FRA FEN 1908 †30 September 1915. Killed in action during World War I.
Paul Lüders GER BPO 1908 †25 February 1916. Killed in action in World War I in Verdun. Eduard von Lütcken GER EQU 1912 †15 September 1914. Killed in action during World War I.
Georges Lutz FRA CYC 1908 †31 January 1915. Killed in action in World War I.
Willy Lützow GER SWI 1912 †1915. Killed in action during World War I.
William Lyshon USA WRE 1912 †13 October 1918. Killed in the final days of World War I.
Henry Macintosh GBR ATH 1912 †26 July 1918. Died from wounds sustained in the Second Battle of the Somme. Duncan Mackinnon GBR ROW 1908 †9 October 1917. Killed in action at Ypres in the Battle of Passchendaele. Gilchrist Maclagan GBR ROW 1908 †25 April 1915. Killed in action in Pilckem Ridge at the Second Battle of Ypres. Jean de Mas Latrie FRA FEN/MOP 1908-12 †5 September 1914. Killed in action in World War I.
Leopold Mayer AUT SWI 1906 †21 September 1914. Killed in action during World War I.
Alphonse Meignant FRA ROW 1912 †4 November 1914. Killed at First Battle of Ypres during World War 1. Robert Merz AUT FTB 1912 †30 August 1914. Killed in action during World War I.
Georg Mickler GER ATH 1912 †14 June 1915. Killed in action during World War I somewhere in Poland. Felice Milano (DNS) ITA FTB 1912 †11 November 1915. Killed at the Fourth Battle of the Isonzo during World War I.
Percy Molson CAN ATH 1904 †5 July 1917. Killed in action when hit by mortar fire while attempting to rescue a fallen friend on the outskirts of Avignon France. Alfred Motté FRA ATH 1908-12 †31 October 1918. Killed in action in World War I.
István Mudin HUN ATH 1906-08 †22 July 1918. Killed in action during World War I.
Edward Nash GBR EQU 1912 †21 February 1915. Killed in action during World War I.
Georges de la Nézière FRA ATH 1896 †9 October 1914. Killed in action during World War I.
Grigory Nikitin RUS FTB 1912 †1917. Killed during World War I.
Charles Oldaker GBR GYM 1908 †26 September 1915 Killed in action during World War I.at the Battle of Loos. Harcourt Ommundsen GBR SHO 1908-12 †19 September 1915. A Lieutenant in the Honourable Artillery Company when he was killed at the Battle of Ieper in World War I.
Alan Patterson GBR ATH 1908-12 †14 March 1916. Commissioned into the Royal Field Artillery he was killed in action only two days after his 30th birthday. Árpád Pédery HUN GYM 1912 †21 October 1914. Killed in action during World War I.
Jacques Person GER ATH 1912 †15 July 1915. From Alsace killed in action in Flanders as a member of the "7. Thüringische Infanterie-Regiment Nr. 96". William Philo GBR BOX 1908 †7 July 1916. Killed in World War I during the battle of the Somme in France. Hermann Plaskuda GER FEN 1912 †21 March 1918. Killed in action in World War I. His grave is in the war cemetary in St. Quentin France. Léon Ponscarme FRA CYC 1900 †24 November 1916. Killed in action in World War I in Verdun. Chris Porter (DNS) GBR FTB 1908 †4 June 1915. Killed in action at Gallipoli serving with the Manchester Regiment. Bobby Powell CAN TEN 1908 Lieutenant in the 48th Canadian Infantry Battalion during World War I. Killed in action while fighting in France. Date and place unknown. Kenneth Powell GBR ATH/TEN 1908-12 †18 February 1915. Killed in action while serving as a private in the HAC. Friedrich Karl Prince von Preußen GER EQU 1912 †6 April 1917. During a flight on 21 March 1917 he was forced to land with a bullet in his engine and a slight wound to his foot. He landed his Albatros aircraft in no-man's land but while running towards his own lines he was severely wounded in the back by Australian troops. He was taken into Australian war captivity where he died from his injuries on 6 April 1917 at Saint-Étienne-du-Rouvray. Reggie Pridmore GBR HOK 1908 †13 March 1918. Served as a major in the Royal Horse & Field Artillery winning a Military Cross on the Somme before being killed in action in Italy. John Prosser (DNS) GBR FTB 1908 †27 May 1917. Killed in action on the Western Front during the Battle of Arras. Joseph Racine FRA CYC 1912 †28 October 1914. With the 113th Regiment Infantry he was killed in action in World War I.
Thomas Raddall GBR SHO 1908 †9 August 1918. With the 8th Battalion Canadian Infantry Manitoba Regiment he was killed in action in France in World War I and is buried in the Manitoba Cemetery in Caix. Maurice Raoul-Duval FRA POL 1900 †5 May 1916. Killed in action during World War I.
Gino Ravenna ITA GYM 1908 Killed in Auschwitz-Birkenau concentration camp date unknown. Josef Rieder GER CYC 1912 †13 July 1916. Killed in action during World War I.
John Robinson GBR HOK 1908 †23 August 1916. Commissioned into the North Staffordshire Regiment he was soon promoted to captain but died from injuries received in the Mesopotamian campaign. Paddy Roche GBR ATH 1908 †7 June 1917. A lieutenant in the Royal Engineers he won an MC in World War I and was later killed in action. Claude Ross ANZ ATH 1912 †19 August 1917. Killed in action in France. Albert Rowland ANZ ATH 1908 †23 July 1918. Killed in action during the Second Battle of The Marne. Marius Royet (DNS) FRA FTB 1908 †1915. Killed during World War I.
Maurice Salomez FRA ATH 1900 †7 August 1916. Killed in action in World War I.
Ronald Sanderson GBR ROW 1908 †17 April 1918. Killed in action near Ypres. Heinrich Schneidereit GER TOW/WLT 1906 †30 September 1915. Killed in action as an artillery officer in France during World War I.
André Six FRA SWI 1900 †1 April 1915. Killed in action. Pierre Six FRA FTB 1908 †7 July 1916. Killed in action during World War I.
Michel Soalhat FRA ATH 1906 †25 September 1915. Killed in action in World War I.
Robert Somers-Smith GBR ROW 1908 †1 July 1916. Killed in action on the first day of the Battle of the Somme. Eberhard Sorge GER GYM 1912 †6 August 1918. Killed in action during World War I.
Alfred Staats GER GYM 1912 †22 October 1915. Killed in action during World War I.
Jenő Szántay HUN FEN 1908 †11 December 1914. Killed in action during World War I.
Géza Szegedy HUN ATH 1906 †1918. Killed in action during World War I.
Geoffrey Taylor CAN ROW 1908-12 †24 April 1915. Missing presumed killed during the Second Battle of Ypres. Felix Tekusch (DNS) AUT FTB 1912 †21 May 1916. Killed in action during World War I.
Waldemar Tietgens GER ROW 1900 †28 July 1917. Killed in action during World War I.
Kostas Tsiklitiras GRE ATH 1906-12 †10 February 1913. Volunteered to fight in the Balkan Wars and fought at the Battle of Bizani where he contracted meningitis and died at the age of 24. Justin Vialaret FRA FTB 1908 †30 September 1916. Killed in action in World War I.
Charles Vigurs GBR GYM 1908-12 †22 February 1917. With the 11th Battalion Royal Warwickshire Regiment he was killed in action in France in World War I and is buried in the Maroc British Cemetery in Grenay. Edmond Wallace FRA FEN 1900 †18 August 1915. Killed in action in World War I.
Rudolf Watzl AUT WRE 1906 †15 August 1915. Died from illness during World War I.
Arthur Wear USA TEN 1904 †6 November 1918. As a result of refusing to obtain proper treatment for a probable perforated duodenal ulcer he died still commanding his battalion during the Meuse-Argonne fighting. Arthur Wilde GBR SHO 1908 †21 January 1916. With the 1st/6th Battalion South Staffordshire Regiment he was killed in action in World War I and is buried in the Arras Memorial. Tony Wilding ANZ TEN 1912 †9 May 1915. Joined the British army and was leading an armoured car unit when he was killed at Aubers Ridge during the Battle of Neuve-Chapelle. Victor Willems BEL FEN 1908-12 †1918. Killed in action during World War I.
Edward Williams GBR ROW 1908 †12 August 1915. With the 2nd Battalion Grenadier Guards he was killed in action in France in World War I and is buried in the St. Venant Communal Cemetery. Herbert Wilson GBR POL 1908 †11 April 1917. Was a captain with the Royal Horse Guards near Arras. Died in the preliminary skirmishes leading up to the Battle of Paschendaele in Ypres Belgium. Richard Yorke GBR ATH 1908-12 †22 December 1914. Killed in action in World War I while serving as a sergeant in the London Scottish. Béla Zulawszky HUN FEN 1908-12 †24 October 1914. Killed in action during World War I. 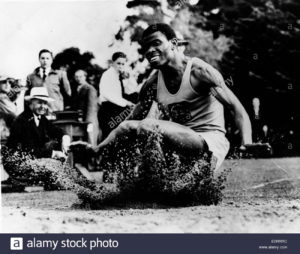 Today, we are continuing our look into Olympians for whom we believe to have identified their date of death but, for whatever reason, we are unable to connect the information, such as obituary or public record, conclusively to the athlete. In particular, we are going to examine three Olympians who would be over the age of 105, thus making it very unlikely that they would still be alive regardless of whether or not they are connected to these death records. 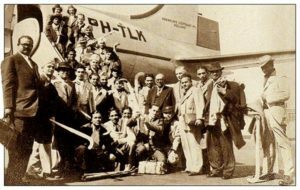 A member of the famous Clube de Regatas do Flamengo, Nelson Ribeiro, born January 14, 1910, was a member of the Brazilian coxed fours squad that was eliminated in the semi-finals at the 1936 Berlin Olympics. His son later became prominent in rowing administration (among other things) and his granddaughter competed in gymnastics at the 1988 and 1992 Olympics, but information on the 1936 competitor is scarce, perhaps clouded by the results for his son. The only suggestion we have for his death came from an entry, now removed, at a genealogical website showing someone with his name having a year of death of 1973. We were unable, however, to find any additional confirmation. 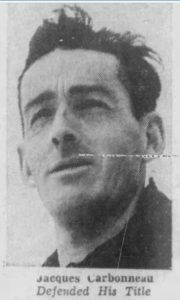 All we know about England-born sport shooter Bill Guillver, born December 28, 1912, is that he took part in the trap event, as a representative of Rhodesia, at the 1960 Rome Olympics and was eliminated in the qualifying round. An anonymous editor to Wikipedia changed his page to reflect that he died in 1998 in Mazowe, Zimbabwe, but, perhaps due to his common name, we have been unable to confirm this. On the other hand, Switzerland’s Rudolf Vilim, born June 15, 1913, has a fairly uncommon name, yet we still know little about him. He did compete in the K-1 1000 at the 1936 Berlin Olympics, where he finished fifth in the event with his partner Werner Klingelfuss, but this is our only record of his international competition. 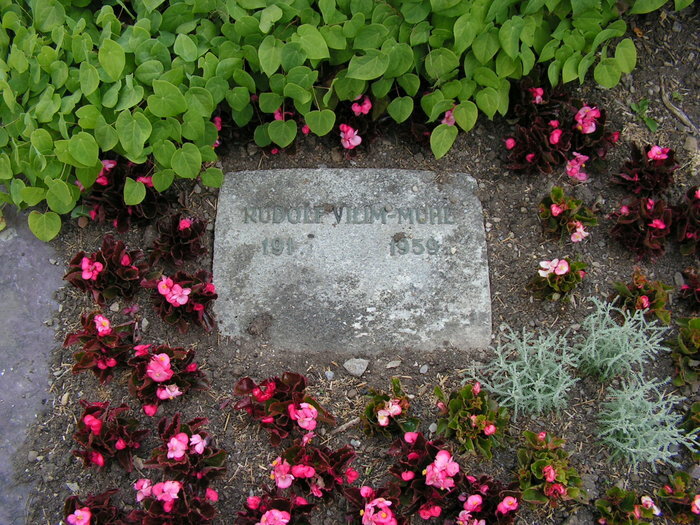 Find-a-Grave lists a Rudolf Vilim, buried in Zurich, as having died in 1959, but the gravestone is missing the final digit of his birth year, thus leaving us unable to verify if this is the Olympian. 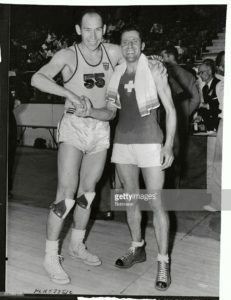 Recently we added Olympic bronze medal-wining wrestler Francisc Horvath of Romania to our list of medalists who, if alive, would be over the age of 90, but for whom no confirmation of their living status has been located. 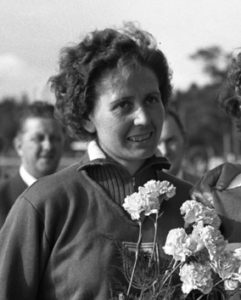 Our blog entry for today begins by suggesting another name for that list: kayaker Gertrude Liebhart of Austria, who took silver in the K-1 500 at the 1952 Helsinki Olympics. Several sources, however, list her as dying some time in October or November 2008, but we have been unable to confirm this; someone with this name was buried in Vienna on November 27 of that year, having died on October 31, but this person had a slightly different birthdate than the Olympian. Whatever the truth, Liebhart is not the only Olympic medalist for whom an unconfirmed date of death exists. Related by marriage to the prominent Sieburger family of Olympic sailors, Jorge Alberto del Río of Argentina, born October 30, 1918, appeared in four editions of the Olympic Games: 1948, 1952, 1960, and 1964. He won his only medal, silver, in the Dragon class in 1960, although he came fourth in that same event in 1952. 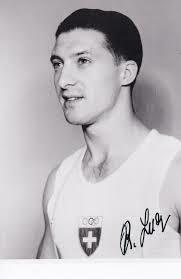 He also won the Pan American title in 1959. The Spanish Wikipedia lists him as having died in 2008, but we have seen no independent confirmation of this elsewhere. 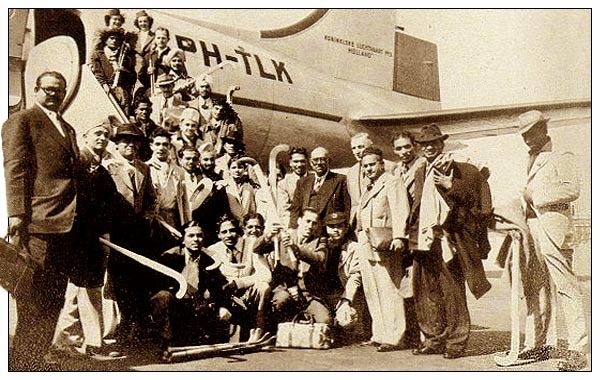 As one of the lesser-known players on India’s gold medal-winning field hockey squad at the 1948 London Olympics, we do not have much concrete information on Reginald Rodrigues, born May 29, 1922. An anonymous editor on Wikipedia, however, claimed that he later moved to Canada, under the name of Reg Rodricks, and died in Montreal. We were able to find a notice that suggested that someone by that name died prior to 2004 in Quebec, but without any evidence to verify the original positing, the trail leads to a dead end. 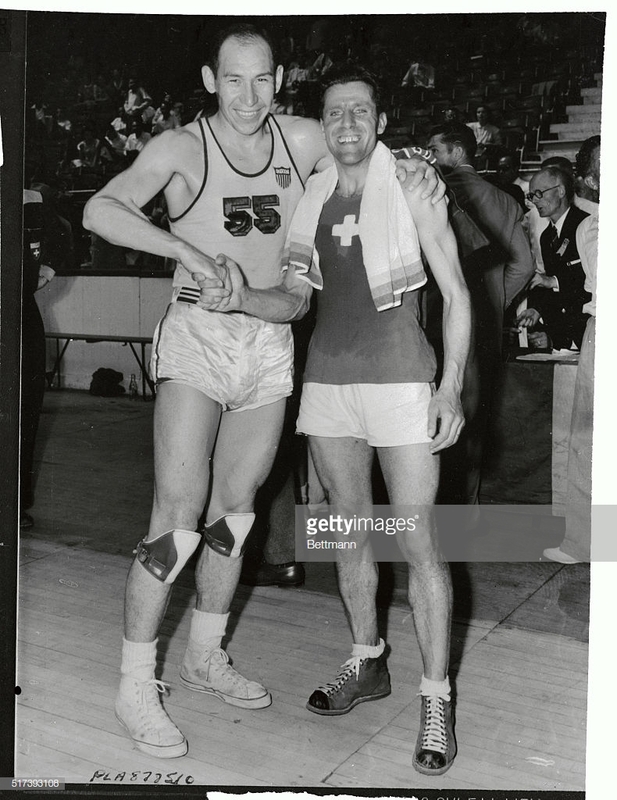 Despite being able to locate a picture, the only information we have on Robert Lucy, born February 20, 1923, is that he won a silver medal with the Swiss squad in gymnastics’ team all-around event at the 1948 London Olympics. An anonymous Wikipedia editor added a date of death of December 23, 2009 to his English-language page but, perhaps because of his common name, we have been unable to confirm this information. As with our other Olympians today, we have very little information on Italian water polo player Renato Traiola, born December 19, 1924. A member of the Circolo Canottieri club of his native Napoli, he helped Italy win a bronze medal in the water polo tournament at the 1952 Helsinki Olympics. Several sources mention that he died January 18, 1988, but we have not seen any reliable sources to confirm this. There are still plenty more Olympic mysteries to be had, and we are going to keep bringing them to you week by week. We thank you for stopping by today and hope that you’ll join us again! We also want to send a special thank you to Ian Taylor, who uncovered an obituary for Josl Gstrein, whom we covered in a previous entry. Thanks to him, we were able to confirm that Gstrein died September 11, 1980. Another Olympic mystery solved! A little bit delayed, but today the Oldest Olympians blog is beginning the new series of entries that we promised a few weeks ago. We are going to begin looking into Olympians for whom we believe to have identified their date of death but, for whatever reason, we are unable to connect the information, such as obituary or public record, conclusively to the athlete. As the objective here is to not only share the “behind-the-scenes” of our research, but also help solve a few of these mysteries, we will be limiting the number of individuals that we cover in one post to something manageable in the hopes of not overwhelming our readers. In that vein, we are going to start with three cases to introduce the topic. The Canadian lineup for the men’s coxed eights includes a man named Robert H. B. Christmas, born c. 1924, as a member of the team. His presence on the squad, which was eliminated in the semi-finals, is the only information we have about him, and researching his life has proven difficult due to the large number of irrelevant results that come up due to his surname being “Christmas”. The Rootsweb obituary index, however, lists an obituary for a “Robert Harry Bernard Christmas”, who died at the age of 76, in the Hamilton Spectator on January 21, 2000. While all the details line up, and thus this seems very likely to be the Olympian, we have not been able to procure a copy of the obituary for review to confirm this fact. Unlike Christmas, we have plenty of information on Cuban gymnast Raimundo Rey, born July 29, 1925. In addition to his appearance at the 1948 London Olympics, where he was 14th with the Cuban team and had a best individual result of 77th in the pommelled horse, he won seven medals – three of which were gold – at the 1951 Pan American Games. He was instrumental in establishing the sport of gymnastics in Cuba, but eventually moved to the United States and settled in Florida. According to some public records, he died in 2013, but we have been unable to locate an obituary or any definite confirmation that he is deceased. One of the most contentious potential sources for previously unknown information is Wikipedia. Information added there could be pure vandalism, but in other cases it could come from privileged sources, such as family members, and thus understandably be unavailable in other mediums. Thus it becomes very important to take a critical eye to any information from the world’s most prominent online encyclopedia. Austrian Nordic combined and cross-country skier Josl Gstrein is one of many cases where we have been unable to verify information on Wikipedia that we have no particular reason not to believe. 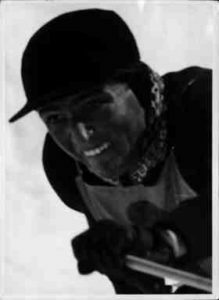 Gstrein had a distinguished skiing career that culminated in an appearance at the 1948 St. Moritz Olympics, where he just missed a medal with the Austrian team in the 4×10 kilometres Nordic combined relay, finishing in fourth. He later had a career running a ski school. The German-language Wikipedia has a year of death of 1980 but, as we have been unable to locate any confirmation elsewhere, the accuracy of this information remains a mystery. As we mentioned above, our aim is to not overwhelm with the number of athletes we engage in each blog, so we are going to stop here for today. For the next several weeks, however, we will be raising several cases per entry in the hopes of solving a few mysteries and sharing our research. If, however, all we accomplish is sharing and celebrating the legacies of some of these athletes, then we will consider these posts successful. We hope, therefore, that you will join us next week!